By following a few design principles and installing only important accessories and furniture, you will surprise yourself with the amount of space you can create in your bathroom. If your bathroom is small and you want to transform it into something more spacious and attractive, below are five viable ideas that will give you some big design inspiration! Nothing would make a bathroom more confusing and complicated than the disorganized mass of objects such as ornaments, bottles and toiletries. Work on making the bathroom as neat as possible by clearing the clutter every evening before retiring to bed or first thing every morning. If you simply can’t bear this, then expand your storage by adding more bathroom cabinets and hide the heap behind closed doors. You can also choose a few objects that you think would work together as design accents and arrange them on shelves, window ledges and other chosen surfaces. As you declutter all the scattered objects on the surfaces of your room, you should also consider the effect you’re going to bring on the overall design. A small bathroom can easily be made an elegant space with discreet, clean and contemporary lines and features, so minimise on patterns and go for attractive finishes, like a tile floor and a natural stone wall. You can use to your advantage the fact that the illusion of a larger space is created when natural light reflects off surfaces by allowing as much light into your bathroom as possible. You can install an illuminated mirror if your bathroom has no windows, or you can increase artificial lighting to create interesting effects. Light shades like cream, taupe and white will not only blend with light to make the room feel bigger but also result in a warm, harmonious design with timeless elegance. If you feel you need some more colour into your interior design, you can opt for a border of glass mosaic tiles, or carefully coordinate flowers, vases and towels to come up with a bold splash of colours. 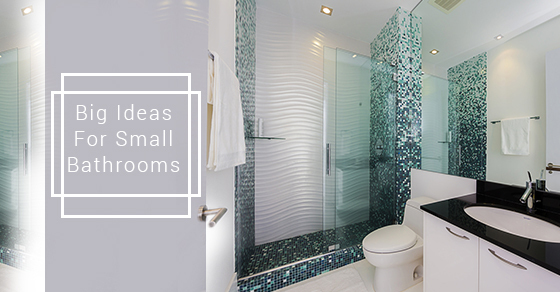 To make the most out of your diminutive floor space, try looking for cleverly designed compact furniture and install a shower in place of a full size bath. Raising bathroom furniture off the floor can also create the illusion of a large space, so choose a semi-pedestal or wall hung basin to make every bit of your tiny floor count. Above the floor, maximise as much as possible on space by installing tall storage units, wall cupboards and shelving. Every bathroom, regardless of the size, can easily be transformed into an attractive, spacious and modern room! Contact our team today for more information how.